Limited Edition! First Print! Official FLIGHT CLUB GEAR! These are one-of-a-kind ordered through Custom Ink to help everyone support Flight Club Foundation and it's Mission. 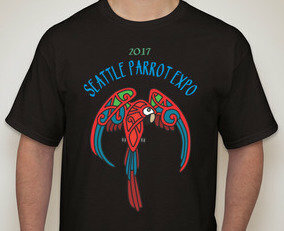 Be a part of the amazing Seattle Parrot Expo Event by buying this tshirt today! Secondary prints and runs will not be the same! Flight Club Foundation: Where parrots bring flight with you as the foundation!